Driver Talent is the top 1 Windows drivers update software, which offers driver solutions. It allows you to find all driver problems, download and install correct drivers. Also it allows you to update to the latest drivers, download drivers for another PC, backup, save and restore drivers. Moreover, you will able to uninstall drivers and do more. 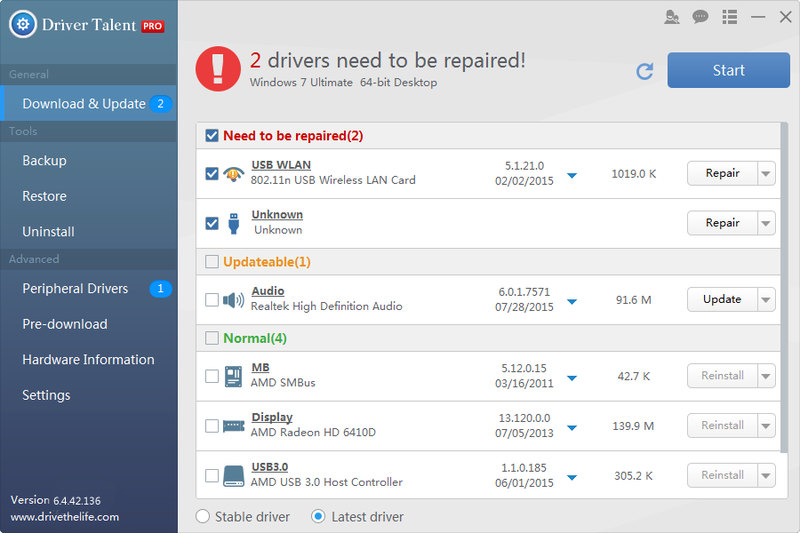 Driver Talent will keep your computer and devices in top condition. This drivers manager has more than 500,000 driver packages, which support 1000,000 kinds of hardware devices including Motherboard, Audio card, Display card, Network card, USB WLAN card, etc. from all brands. You can enjoy top gaming experience. Driver Talent will keep all drivers including graphics drivers and game components drivers up-to-date. It ensures stable hardware performance and fixes errors quickly once they occur when you are playing games. With one-stop Windows driver management, you can backup, restore, uninstall and pre-download drivers with one click. Driver Talent for Network Card is specially designed to solve wired/wireless network driver problems. It allows you to install WiFi/ wireless/ Ethernet/ wired drivers without internet connection.